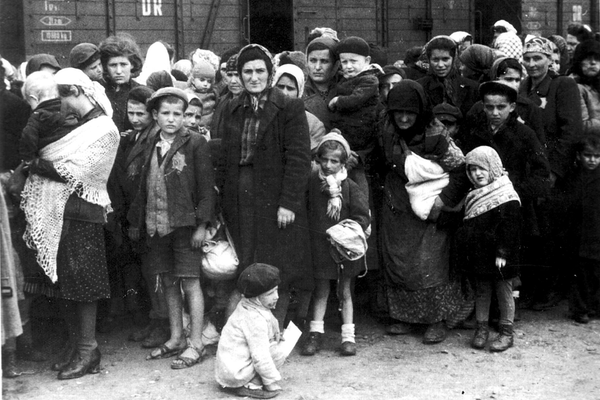 Hungarian Jewish Women and children after their arrival at Auschwitz. The railway lines and bridges across which Hungary’s Jews would be deported to the Auschwitz death camp in Poland were within range of American bombers. So were the gas chambers and crematoria in the camp itself. The refusal of the Roosevelt administration to drop bombs on those targets is one of the most well-known and troubling chapters in the history of international responses to the Holocaust. What few realize today is that U.S. planes actually did bomb part of Auschwitz—but they left the mass-murder machinery, and the railways leading to it, untouched. Why? The same week that the Germans occupied Hungary, two Jewish prisoners in Auschwitz were in the final stages of plotting to escape, something that only a tiny handful of inmates had ever accomplished. Their goal was to alert the Free World that the gas chambers of Auschwitz were being readied for the Jews of Hungary. They hoped these revelations would prompt the Allies to intervene. On April 7, 1944, Rudolf Vrba, 19, and Alfred Wetzler, 25, slipped away from their slave labor battalion and hid in a hollowed-out woodpile near the edge of the camp. On the advice of a Soviet POW, the fugitives sprinkled the area with tobacco and gasoline, which confused the German dogs that were used to search for them. After three days, Vrba and Wetzler emerged from their hiding place and began an eleven-day, 80-mile trek to neighboring Slovakia. There they met with Jewish leaders and dictated a 30-page report that came to be known as the "Auschwitz Protocols." It included details of the mass-murder process, maps that pinpointed the location of the gas chambers and crematoria, and warnings of the impending slaughter of Hungary's Jews. "One million Hungarian [Jews] are going to die," Vrba told them. "Auschwitz is ready for them. But if you tell them now, they will rebel. They will never go to the ovens." The fate of Hungarian Jewry unfolded before the eyes of the world. Unlike previous phases of the Holocaust, which the Germans partially succeeded in hiding from the international community, what happened in Hungary was no secret. A common refrain among defenders of President Franklin D. Roosevelt’s response to the Holocaust is the claim that he and his administration learned about the deportations from Hungary too late to do much about it. For example, a recent essay in The Daily Beast, by journalist Jack Schwartz, claimed that “The Allies learned of the Hungarian deportations and their lethal destination in late June”—that is, not until five weeks after the deportations commenced. But in fact, Washington knew what was coming. At a March 24, 1944, press conference, FDR, after first discussing Philippine independence, farm machinery shipments, and war crimes in Asia, acknowledged that Hungary’s Jews “are now threatened with annihilation” because the Germans were planning “the deportation of Jews to their death in Poland.” The president blurred the issue by coupling it with a remark about the danger that “Norwegians and French” might be deported “to their death in Germany,” but the key point is clear: If we wonder “what did they know, and when did they know it,” the answer with regard to Hungary is that the Roosevelt administration knew plenty, and knew it early. Likewise, on May 18, the Times reported that “a program of mass extermination of Jews in Hungary” was underway, with the first 80,000 “sent to murder camps in Poland.” The notion that the Roosevelt administration only learned about all this in “late June” is preposterous. Meanwhile, copies of the Auschwitz escapees’ report reached rescue activists in Slovakia and Switzerland. Those activists then authored an appeal to the Roosevelt administration to bomb “vital sections of these [railway] lines, especially bridges” between Hungary and Auschwitz, “as the only possible means of slowing down or stopping future deportations.” The plea reached Washington in June. Numerous similar appeals for bombing the gas chambers, or the rail lines and bridges leading to them, were sent to U.S. officials by American Jewish organizations throughout the spring, summer, and fall of 1944. Assistant Secretary of War John McCloy was designated to reply to the requests. He wrote that the bombing idea was "impracticable" because it would require "diversion of considerable air support essential to the success of our forces now engaged in decisive operations." He also claimed the War Department's position was based on "a study" of the issue. But no evidence of such a study has ever been found by researchers. In reality, McCloy's position was based on the Roosevelt administration’s standing policy that military resources should not be used for "rescuing victims of enemy oppression." That’s nonsense. The “military reality” was that at the same time McCloy was saying Auschwitz could not be bombed, Auschwitz was being bombed. Not the part of Auschwitz where the gas chambers and crematoria were situated, but rather the part where slave laborers were working in German oil factories. On August 20, a squadron of 127 U.S. bombers, accompanied by 100 Mustangs piloted by the all-African American unit known as the Tuskegee Airmen, struck the factories, less than five miles from the part of the camp where the mass-murder machinery was located. There were additional Allied bombing raids on the Auschwitz oil factories throughout the autumn. American and British planes also flew over Auschwitz in August and September, when they air-dropped supplies to the Polish Home Army forces that were fighting the Germans in Warsaw. They flew that route twenty-two times, yet not once were they given the order to drop a few bombs on the death camp or its transportation routes. Wrong, and wrong again. The minutes of Jewish Agency leadership meetings show they opposed bombing for a period of barely two weeks, and even then only because they mistakenly thought Auschwitz was a labor camp. Then they received the Vrba-Wetzler “Auschwitz Protocols,” revealing the true nature of the camp. At that point, Jewish Agency representatives in Washington, London, Cairo, Geneva, Budapest and Jerusalem repeatedly lobbied U.S., British and Soviet officials to bomb Auschwitz and the routes leading to it. As for American Jewish leaders, a grand total of one of them urged the Allies to use ground troops against Auschwitz instead of air raids. By contrast, pleas in support of bombing were made in Washington by multiple representatives of the World Jewish Congress, Agudath Israel, the Labor Zionists of America, and the Emergency Committee to Save the Jewish People of Europe (the Bergson Group). Calls for bombing also appeared in the columns of a number of American Jewish newspapers and magazines at the time. Now we come to the vexing question of why the Roosevelt administration rejected the bombing requests. The explanation that the administration gave at the time—that bombing Auschwitz or the railways would require diverting bombers from battle zones—was clearly false, since we know that U.S. bombers did bomb other targets within the Auschwitz complex (the oil factories). A second argument has been made by some FDR apologists: that bombing was a bad idea because some of the Auschwitz inmates would have been killed. But that does not hold up, either—first, because that was not the reason given for the rejections at the time; and second, because it fails to explain why the administration refused to bomb the railway lines and bridges, which would not have involved any risk to civilians. So what, then, was the real reason for the administration’s rejection? In all likelihood, it was the result of several factors. One was old-fashioned antisemitism. The antisemitic sentiments rife among senior officials of the State Department and War Department have been amply documented. What about the White House? Jack Schwartz, in The Daily Beast, mocked any suggestion that President Roosevelt harbored antisemitic feelings, pointing out that he “surrounded himself with Jewish advisers” and “staffed the New Deal…with Jewish activists.” In other words, some of FDR’s best friends were Jewish. A more informed perspective would consider Roosevelt’s actual statements on the subject. For example, as a member of the Harvard board of governors, he helped impose a quota on admitting Jewish students so they would not be “disproportionate,” as he put it. He called a questionable tax maneuver by the owners of the New York Times in 1937 “a dirty Jewish trick.” He said in 1938 that the behavior of “the Jewish grain dealer and the Jewish shoe dealer” was to blame for antisemitism in Poland. Do such statements reflect antisemitism? Or when it comes to assessing antisemitism, should there be one standard for revered former presidents and a different standard for everyone else? This is not to say that antisemitism and the fear of pressure to admit refugees were the decisive factors. More likely they served to buttress or reinforce the main factor, which was the overall mindset in the administration that America had no national interest nor moral obligation to pursue humanitarian objectives abroad. Bombing bridges and railway lines over which both deported Jews and German troops were transported could have qualified as necessary for military purposes. But not when the prevailing attitude in the White House and other government agencies was one of hardheartedness when it came to the Jews, reinforced by antisemitism and nativism.